Book hotel rooms online with us at Vale Do Lobo Resort Hotel at the lowest rate, guaranteed. 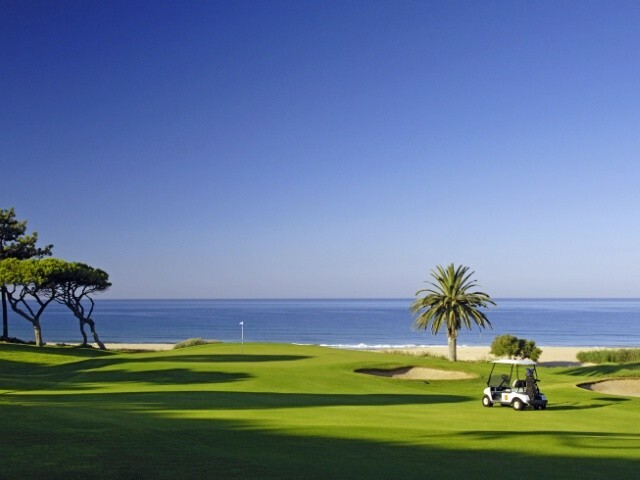 Get your holiday discount room rate at the 5 Star Vale do Lobo Luxury Golf and Beach Resort located on the beachfront in the central Algarve. The complex has 100 modern comfortable one, two or three-bedroom apartments providing holiday accommodation from two to six adults. The Vale do Lobo Luxury Golf and Beach Resort apartments have either a pool or a Hot Tub, or neither. Resort guests have the unique advantage of being able to choose from a range of 25 different sports, or, one of the many leisure activities, or, just loll on the beach and watch others participating in water sports. The resort apartments are air-conditioned and have kitchens or kitchenettes, cable TV and radio, direct dial phones, a safe and maid service. Vale do Lobo Luxury Golf and Beach Resort many facilities include two challenging 18-hole golf courses, Royal Spa with massages and beauty treatments, 15 restaurants, snack-bars, bars, a central outdoor pool, a Fun Zone for internet access and designed for teenagers, a Kangaroo Kids Club and playground, supermarket, banks, shops, an active Tennis Centre with 14 courts with different surfaces, an Art Gallery and a 24 hour Medical Centre. Two important factors are that there is an Internal Circuit Bus for guests and there are also a constant 24 hour security patrols. Pets are allowed.